Unfortunately The Blot won’t be able to attend MondoCon 4 this weekend in Austin, Texas due to a prior family commitment, and I’m totally bummed about it. My one big regret is missing the opportunity to meet legendary artist Drew Struzan, who will be in attendance at Mondo’s annual convention celebrating all things pop culture and art! Struzan is a true icon, having painted signature movie posters for films like Star Wars, Indiana Jones, ET, Back to the Future, The Goonies, Blade Runner and so much more! 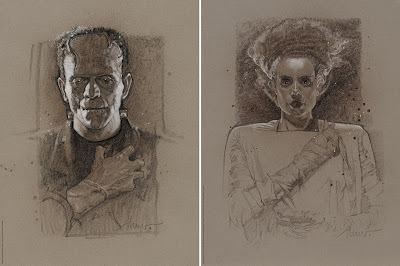 As part of his MondoCon appearance, Struzan will be releasing this fantastic Frankenstein and Bride of Frankenstein screen prints! Each signed and numbered print measures 18”x24”, is limited to 150 pieces and will retail for $100. I can’t wait to see what other goodies Struzan has with him this weekend!